Ken Magee Author | Where ancient magic meets the Internet. Okay, so what is Dark Tales and Flash Fun all about? Well, here’s the introduction from the book… I think it explains it pretty well. Over the years, I’ve written a lot of words. Most of my efforts were focussed on novels but between the books, or at times when ideas were maturing, I penned a number of short stories and quite a few drabbles (stories which are exactly 100 words long). 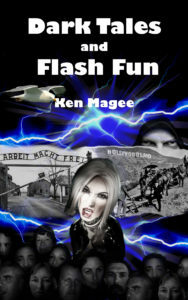 Dark Tales and Flash Fun is a collection of these bits and pieces. There’s no connecting theme other than each work is designed to be entertaining, frightening or intriguing. In part,I wanted to create an easy way for people to find out a bit about me and my writing without having to dive straight into the trilogy. I also wanted to gather together a lot of the various bits of my work in one place. If nothing else, that allowed me to tidy up my computer files… now I just need to sort out all the ideas I have in notebooks and on scraps of paper. Dark Tales and Flash Fiction is available from Amazon, Apple, Barnes & Noble/Nook, Kobo and Scribd. 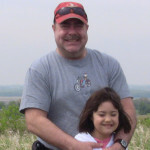 This entry was posted in Drabbles, Humor, Publications, Short Story and tagged anthology, Fantasy on April 16, 2016 by Ken Magee. In the first few paragraphs of Dark Tidings, I tried to set the scene for one of the threads of the adventure. Tung, one of the main protagonists, finds himself awaiting execution in a medieval dungeon and I wanted to create the sense of utter despair and hopelessness which he felt. I think it works well as a scene-setter but I often wonder whether there’s enough in it to hook potential readers. Using Amazon’s ‘Look Inside’ feature, many people check out the first few pages so grabbing the attention is vital. The other attention-grabber is the blurb and I’ve included what I use for Dark Tidings below. Again, I wonder if it contains enough hooks to make people want to read more i.e. buy the book. Way back in the medieval mists of time, long before most people counted which century was which, Tung shivered violently on the ice-cold stone floor of the executioner’s dungeon. Dark, dank and putrid were the words an unscrupulous property merchant might have used to glamorise this miserable dungeon, no words were hideous or nauseating enough to describe the true horror of this dreadful place. To be fair though, it wasn’t all bad, at least the green slime, which oozed like pus from small cracks in the walls, added some colour to the drab greyness. Tung huddled in the darkest corner of the freezing granite cell wishing he was dead. He wouldn’t have to wait long for his wish to come true because he was due to be tortured to death the very next day. Roll on death, it couldn’t come a moment too soon. He was soaking wet, bruised, starving and parched with thirst. Yes, roll on death. All he could do was pray for the merciful nothingness of sleep before the excruciating morning. He tossed and turned like an agitated foetus. How could anyone sleep in this frightful place? Hands over ears, he tried to shut out the sounds of torturers’ hammers smashing bones, the metallic clunk of ratchets on the racks and the anguished screams which echoed forlornly down stone corridors. Rank stenches crept under the door to assault his nostrils, the acrid stink of flesh seared by white-hot branding irons overwhelming the other odours of human sweat, urine and excrement. Wails of despair reverberated inside his head. Did these evil tormentors never rest? By some miracle, his brain dragged his tortured body into an uneasy slumber. Praise the gods for the gift of sleep, at least he still had this last sanctuary. His nightmares replayed his pathetic life as his subconscious tried to figure out how he’d ended up in this pitiful mess. The work of the devil, no doubt – with a little help from his fiends. Chapter 1 continues in the book. A thousand years ago, a young thief, Tung, and a disgraced wizard, Madrick, are thrust together in an executioner’s dungeon. In the darkness, Madrick reveals an incredible secret about a legendary spell. The great spell helps them escape their prison cell… and eventually their century. Funny and frightening, Dark Tidings is book one of the spellbinding ‘Ancient Magic Meets the Internet’ trilogy. What do you think about both the opening of chapter 1 and the blurb? Any constructive comments are always gratefully received. 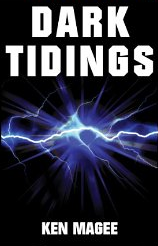 Dark Tidings is available from Amazon. 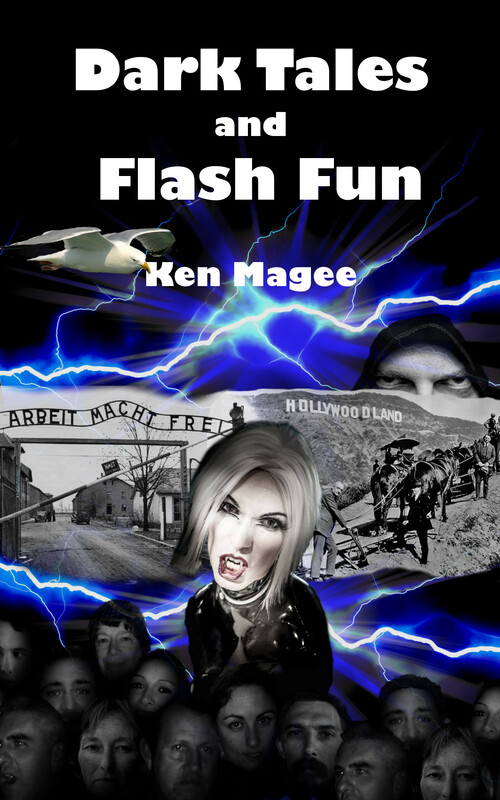 This entry was posted in Uncategorized and tagged blurbs, Humor, opening lines, writing on May 16, 2016 by Ken Magee. As a follow on to my introduction post about the ART authors (see footnote re ART), I’d like to give you a bit more of an insight into the writing of Rick Haynes. 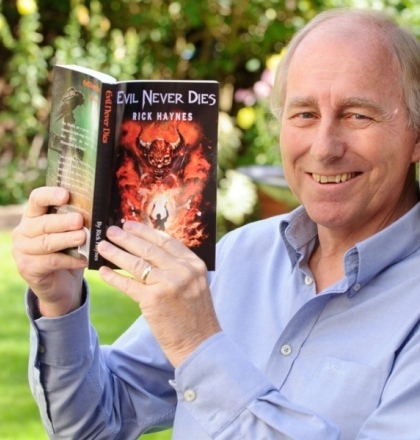 As you can see from his Amazon Author Page, Rick has published quite a range of work but I’d like to share the blurb and the prologue from book #1 of his Maxilla Tales, Evil Never Dies. The Maxilla are a peaceful clan but can they survive the latest threat from Myracadonis, the shaman? Tarn is ordered to lead the Maxilla into battle for the first time, but a man with the mark of greatness will always have enemies. Grona hates everyone, including his son, Tarn. Both men are destined to be heroes yet only one can stand before the gates of hell and win. The gods are always watching, but whose side will they ultimately favour? Exciting stuff, eh? Why not treat yourself and grab a copy of Evil Never Dies? ART is a banner under which a group of like-minded authors are working collaboratively with their readers to create stories designed to entertain, enchant and amaze. I’ll be using this logo on all ART related posts so keep your eyes peeled. This entry was posted in ART and tagged Evil Never Dies, Fantasy, Rick Haynes on March 8, 2016 by Ken Magee. Is there anything more satisfying than finding a great, new writer to feed your reading habit? Well, how about discovering three all at the same time? These guys all have their own styles and unique imaginations. Even the way they describe themselves gives you a clue about their fascinating backgrounds; backgrounds which enrich their writing. 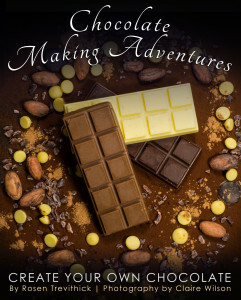 Give yourselves a treat and check out their books via the links below. In the 1990s and 2000s, I worked on both television and feature films as an animator and storyboard artist/designer for Marvel Films, Hanna-Barbera, Sony Pictures, DreamWorks SKG, and Warner Bros Feature Animation, amongst others. Now I work for the U.S. Government in return for a steady paycheck and job security, allowing me to continue my wasteful habits of eating and providing for my family. 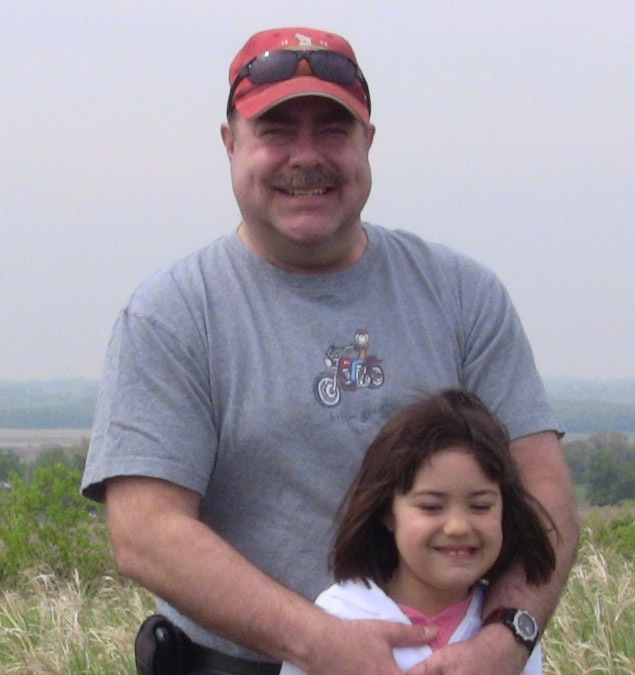 I live in North Dakota, USA with my wife and daughter. Creatively starved by my government job, I turned to writing at the advice of my wife, a fellow Hollywood expatriate who writes both screenplays and novels. That led to my current obsession with 5th century Wales, which is the setting of my ‘Dragon’s Treasure’ series. The first two novels, ‘The Forgotten Princess of Môna’ and ‘A Cold, White Home’ are currently available as e-books and I continue toward completing the final two installments, which are written but as yet untitled. Find out more at Guy’s Amazon author page. Many years ago, when I was just a small boy gazing in wonder at his first chest hair, I decided that I was going to become a tramp. I was going to drop out and go to Strathclyde. Why Strathclyde? God only knows, but every man must have a goal in life. Being an engineer or a pilot didn’t cut it for me. My soul was filled with wanderlust and the need for adventure. So, after leaving home, I dropped out. I even went to Strathclyde, passing through it in a sleepy haze while being rocked gently to slumber in the passenger seat of an unknown truck. Since then, I have done many things and seen many places, always following my instincts and trusting in my destiny. I am self-taught in many things; a jack of all trades and a master at none, but I’ve always got by. A strong self-belief has brought me through many adversities. I try to be the best I can be and often fail, but I continue, nevertheless. I’ve been writing since I was that small boy, mainly poems and an occasional short story. Maerlin’s Storm was first written over a decade ago. It wasn’t something I planned to do. I didn’t wake up and say, I’m going to be an author. Far from it. Like many things in my life, it all started with a dream. The next morning, I wrote a poem. Later, it became a story and this small seed became my beanstalk. People read it and enjoyed it, but then life became busy again. For many years the story sat, collecting dust. It would have stayed on the shelf, forgotten, but fate had other plans. I now have 5 published novels. Three are part of the Storm-Bringer Saga, an Epic Fantasy series. 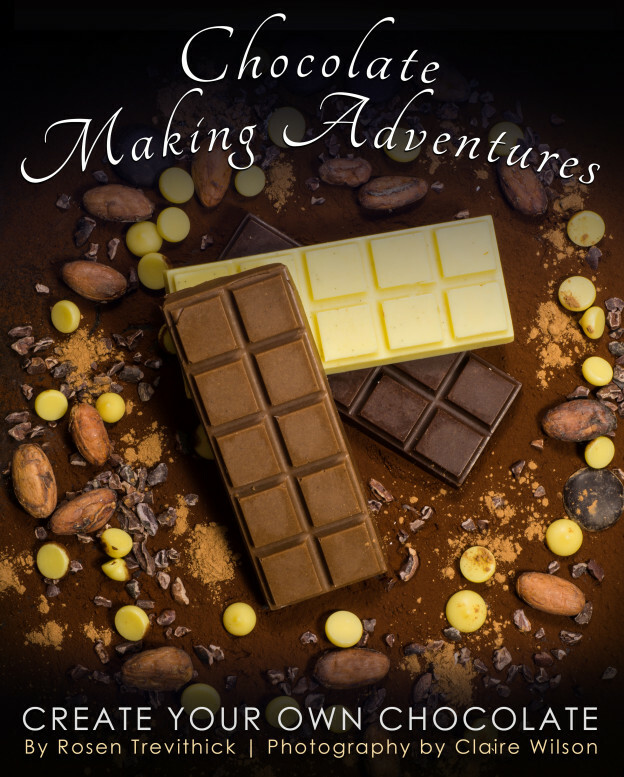 I also published a collection of drabbles and poems: Little Words … Full of Big Worlds, a collection of short stories and drabbles: Bananas in my Shorts, and a collaboration short story. Find out more at Nav’s Amazon author page. Hi, my name is Rick Haynes. I am an author and award winning Drabblist. My passion is medieval fantasy but I also write short stories and Drabbles in many different genres. And welcome you into the world of my imagination. 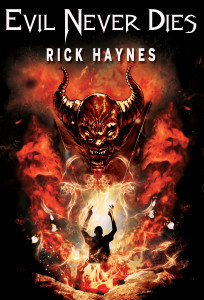 Find out more at Rick’s Amazon author page. This entry was posted in ART and tagged ART on February 11, 2016 by Ken Magee. 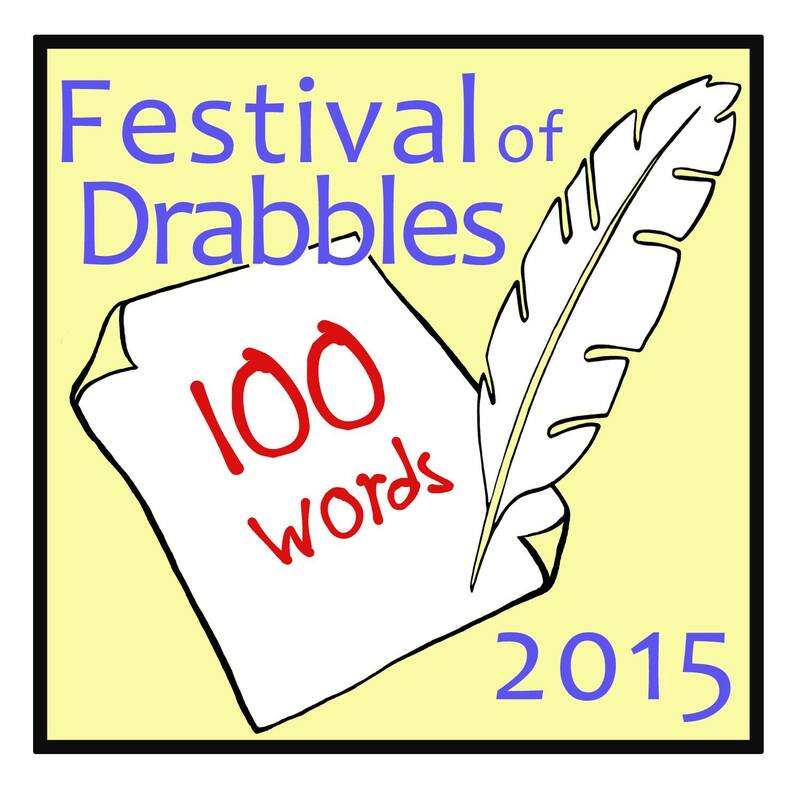 The amazing Micheal Brookes has come up with the idea of a festival of drabbles. In his words, here are his ideas so far and I’m certainly delighted to support his endeavours. The first Festival of Drabbles will start on November 9th and run until the 15th. It will be a week long celebration of drabbles and the art of drabble writing including some of the finest drabblists in the world. If you’re new to drabbles then they are a form of flash fiction in which the story is told in exactly 100 words. I’ve been a fan of the drabble form since they were introduced as a daily feature in the Indie Book Bargains newsletter (now Book Hippo) a few years ago. As a writer it’s a challenge of economy and editing to tell a story in so few words. 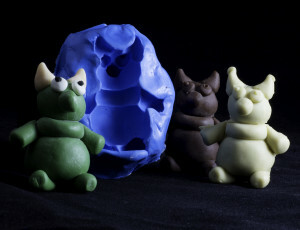 It’s also an excellent way to play with new ideas and to explore areas that you normally wouldn’t. As a reader I enjoy a bite sized tale in those few quiet minutes in the day. They’ve also introduced to me to new authors whose work I would otherwise have missed. It’s a form that deserves greater recognition and so Michael is organising a week of drabble related reading and activities. He already has plans for how his blog The Cult of Me will contribute to International Drabble Week. He’ll share these nearer the time, but one thing is certain, it will include a drabble competition. If you have a blog or website then post an announcement for the Festival, you are free to use the logo and text for this purpose. If you are on Facebook then join the event, invite any friends that you think would be interested and share the event on your timeline and any appropriate groups you participate in. If you’re on Twitter then tweet a link to this event and if you can use the #festivalofdrabbles hashtag that would be great! 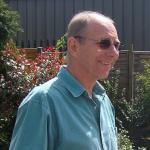 Learn more about Michael at his The Cult of Me blog or check out his guest drabble Clowns. And don’t forget, if you fancy having a go at a drabble, please check out Are You a Secret Drabblist? Good luck, Michael, I hope your Festival is a stunning success. This entry was posted in Drabbles on August 22, 2015 by Ken Magee. What do you call a pair of crows? Answer – attempted murder. This type of joke is from a genre called highbrow humour. Why… because you have to have some specific knowledge before you can understand the joke. In this attempted murder case (pun intended) you have to know that the collective noun for three or more crows is a murder. Ah, now the joke makes sense… and leads us nicely into what this post is actually about i.e. 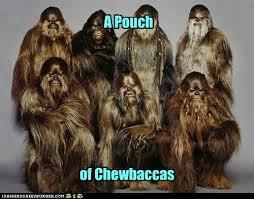 collective nouns. It never ceases to amaze me just how many collective nouns there are in the English language. For example, we have a murder of crows (you knew that! ), a belt of asteroids, a cackle of hyenas, a flight of stairs, a sentence of judges, an impatience of wives and a den of thieves. These ones are fairly normal and, I’d guess, fairly widely known. If you Google ‘collective nouns’ you’ll find a wealth of words describing nearly every group imaginable. Even with the abundance of official collective nouns, there are still a lot of groups which have yet to be allocated their own special word. Any more for any more? For example, what is the above group of collective nouns called? This entry was posted in Uncategorized, Writer's Block and tagged collective nouns on June 18, 2014 by Ken Magee.